Don't worry if you get on the scale and find that your weight has gone up or down a few pounds from the day before. This variation is perfectly normal, according to CNN Health diet and fitness expert Dr. Melina Jampolis. Your body weight can fluctuate anywhere from 2 to 4 pounds per day on average, notes an August 2012 "U.S. News & World Report" article. The amount of food you eat, how much water you drink, how much you exercise and how much you've gone to the bathroom can all temporarily influence your weight. Weight training can cause your muscles to retain water, and your body may also retain more water if you've eaten a lot of carbohydrates. Salty food intake, hormonal fluctuations and constipation can also affect your weight, temporarily making you a few pounds heavier than usual. 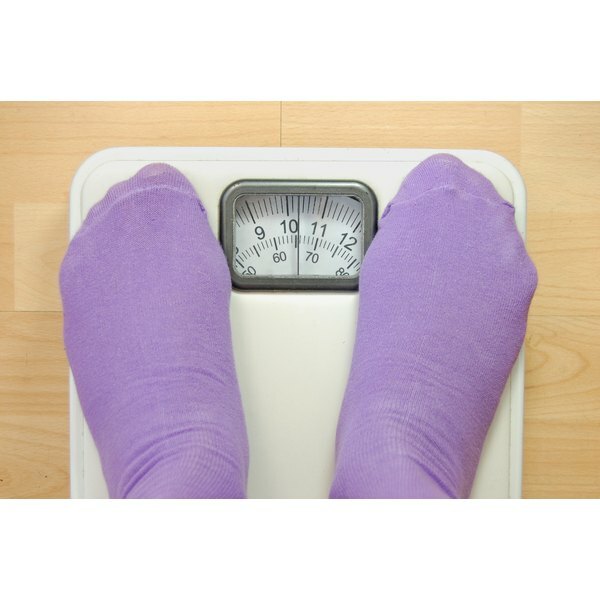 Weighing yourself once a week on the same day and at the same time of day can help you get a more accurate idea of what you weigh and how your weight is changing. Consumer Reports: Q&A: Are Short-Term Weight Fluctuations Normal? CNN: How Is It Possible For My Weight Tto Fluctuate So Much?